…Non potete immaginare la mia faccia nel leggere questa notizia: un vero, original pudding…Oh mamma…e chi l’aveva fatto mai? Quindi…come si fa un pudding? 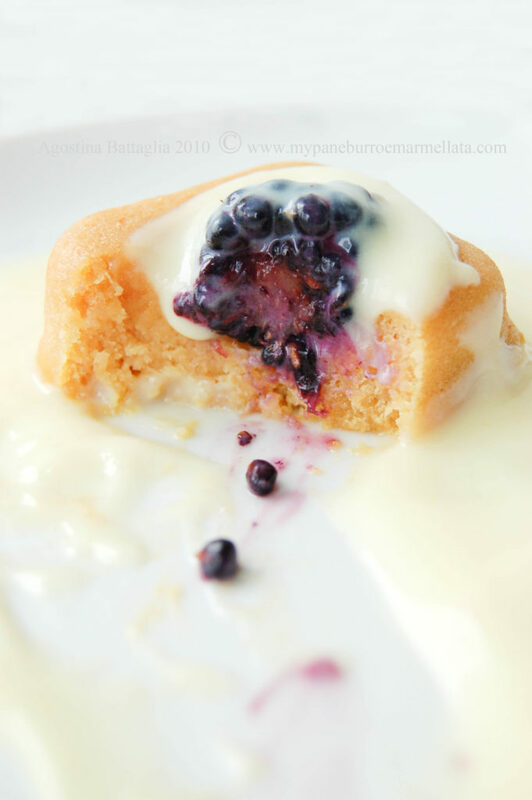 La mia idea era creare un pudding dolce e non stuccoso…spugnoso al punto giusto….bello da vedere ed anche commestibile (!). Preriscaldare il forno a 180°. Versare il succo d’arancia in un pentolino e ridurlo quasi fino a metà. Sbattere a crema il burro e lo zucchero. Unire i tuorli, uno alla volta, sbattendo bene dopo ogni aggiunta; unire la farina. Unire gradualmente il succo d’arancia. In una terrina sbattere gli albumi a neve ed unirli delicatamente ai tuorli. Suddividere l’impasto nelle formine prescelte (io ho usato uno stampo da savarin in silicone). Disporre gli stampi in una teglia da forno piena di acqua calda – quest’ultima deve raggiungere i 3/4 degli stampi. Passare in forno per 35 minuti circa (i pudding devono risultare abbastanza solidi al tatto e muovendoli non deve esserci gioco). Sfornare e lasciar intiepidire, prima di estrarli dagli stampi. 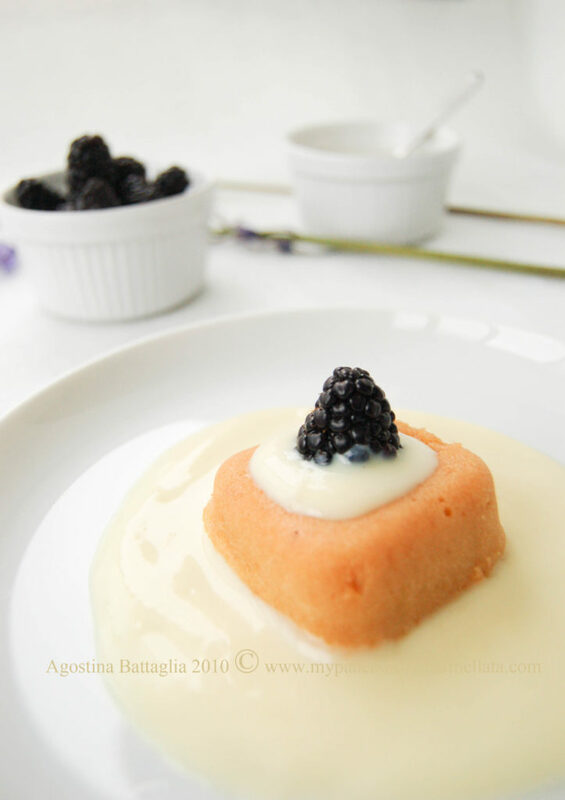 Su un piatto da dessert, versare un pò di crema inglese, disporre il pudding, versare nell’incavo da savarin un altro pò di crema inglese ed infine inserire al centro una mora. 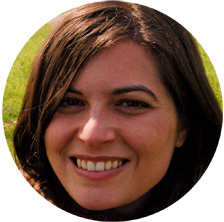 The April 2010 Daring Bakers’challenge was hosted by Esther of The Lilac Kitchen. She challenged everyone to make a traditional British pudding using, if possible, a very traditional British ingredient: suet. … You cannot imagine my face to read that this month Daring Bakers ‘challenge was the preparation of a pudding … a true original pudding … Oh Mom … and who did it ever? So … how to make a true sponge pudding? About suet, I don’t like it in the sweet doughs, so I’ve replaced it with butter. My idea was to create a pudding cake, sponge and not too sweet … at the right …. looks great and edible (!). Preheat the oven to 350 degrees F. Pour orange juice into a saucepan and reduce until almost halfway. Divide the dough in the selected molds (I used a savarin silicone mold). Place the molds in a baking pan filled with hot water – it should reach 3 / 4 of the molds. Go in the oven for 35 minutes (the pudding should be firm enough to touch and moving them there should be no play). Remove from the oven and let cool before extract from the molds. Pour some custard on a dessert plate, place the pudding, pour in the savarin groove a little bit of custard and then insert a blackberry in the center. 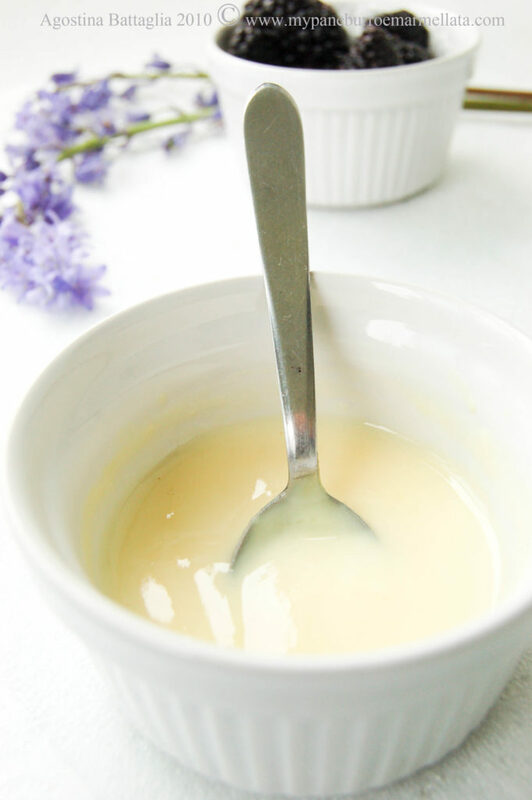 Beat with a fork, the yolk and sugar, add the cornstarch, the vanilla bean open and dilute all with milk. Go to MO for 1 minute at maximum power. Remove from the oven, stir and put in oven for 45 seconds. Repeat 2 more times, until the cream is thicken. Remove from the oven, stir and make cold. That looks so good, and I am totally fascinated by that microwave custard sauce! I may just have to try that! Excellent job on the challenge. Microwave custard sounds inspired. Good job on the challenge! Custard in the microwave?! 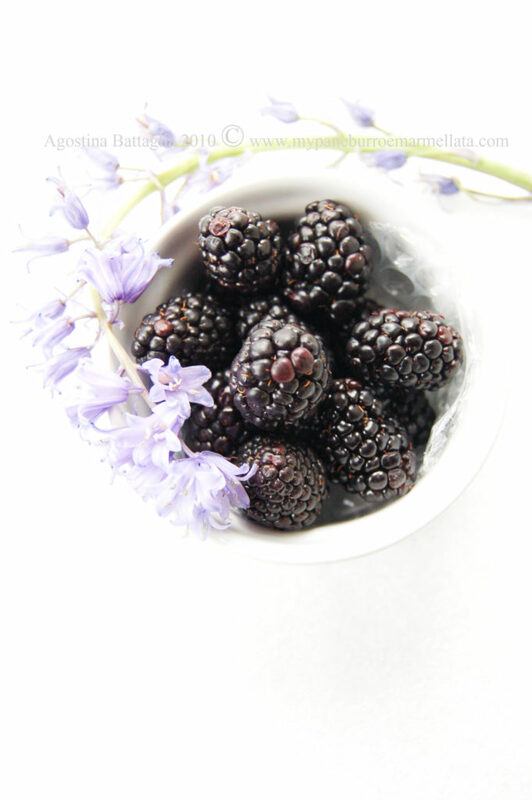 Huh…<br />Your pudding looks delicious, and I love the idea of blood oranges and blackberries together! 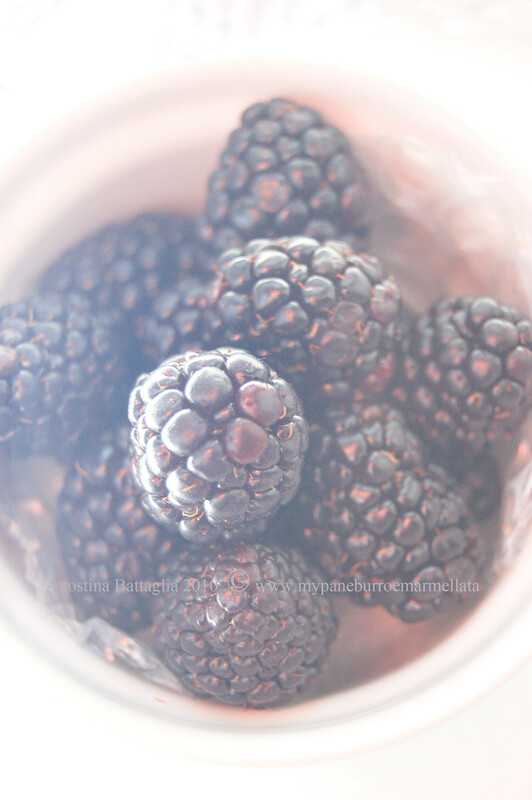 ho sempre guardato con diffidenza gli english puddings…. ma nel tuo ci affonderei volentieri un cucchiaino! complimenti foto bellissime! !<br />baci! Wow, what exotic flavors! I love the color of the blood orange pudding. Great job on your challenge! 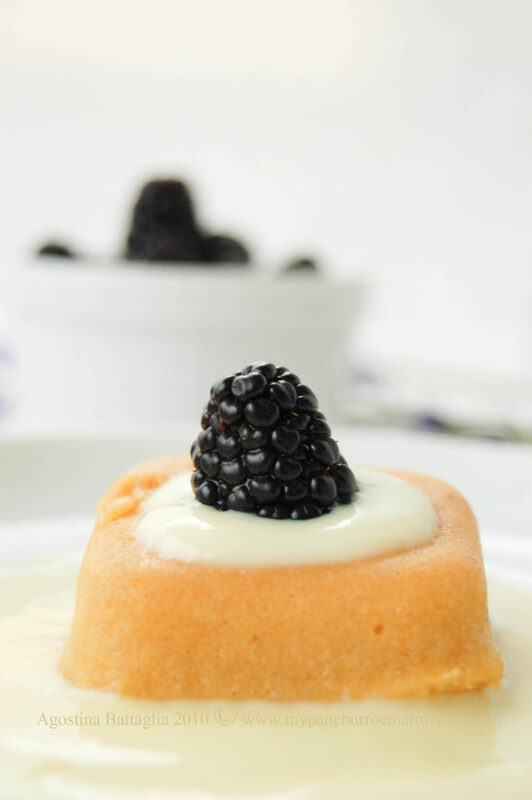 Orange pudding with custard and mulberries – sounds delicious, Ago! Did you like it? What a wonderful looking pudding it looks like a restaurant dish. Delicious effort great work. Cheers from Audax in Sydney Australia. Haha microwave pudding that comes out looking like the best resturant food in the world. Nice job! Ooops, stavo per perdermelo questo pudding. ma lo sai che non l&#39;ho mai fatto e non l&#39;ho nemmeno mai mangiato ai tempi del mio soggiorno a londra? quasi quasi ci provo son proprio curiosa e poi mi sembra anche semplice da preparare. grazie per la ricetta! Ago, I thought I would reply to your question (on my blog) here. Yes, do use baking powder, it will rise nicely and be lovely and light. A little bit like a cake. Really, that&#39;s what it is a cake but cooked in a steamer so it doesn&#39;t get a crisp crust but stays moist. This looks wonderful, with the blood oranges and the blackberries (and the pudding and custard too)! Excellent pudding! Ciao Ago, questo pudding lo sto mangiando letteralmente con gli occhi ;D. Momma mia! Quando passo da te mi perdo un pò ;D.<br />Un bacio e bravissima! Ma sei una forza!!! Non ho mai mangiato un pudding ma guardando le tue foto…sono meravigliosamente delicate…mi hai fatto venir voglia di provare!! !<br />un abbraccio!! Nice job on the challenge. It looks very refreshing. Such a pretty looking pudding. Liked the fruit and colour in it. Ciao Ago !Che bello il tuo pudding !! Il grasso di rognone è più leggero dello strutto …non so se mi ha proprio conquistata ma quasi ! I problema è far capire cosa si vuole al macellaio il mio buttava via anche il rognone ! Baci e grazie ! Ps hai una bellissima cucina ! Just found this post – gorgeous! One of my favorite of the puddings for sure! It looks soooo delicious.